A reply I made to Computertimes was published. after reading your article “Stamp out spam” CT 15 Jan 2003, I thought I’d like sharing how I stop SPAM. I have my own domain so that may be a priviledge but a domain is quite cheap to get nowadays complete with free POP3 e-mail address, spaces to host your own websites etc. I creates a few e-mail address and one someuserID@etegration.com was recently deleted as too much spam goes there and I now use someuserID@etegration.com, no diff to me as they are all re-directed to someuserID@etegration.com Once an e-mail gets too much spam, I stop using it and move to another userID. A few frens have accounts on my domain and we all do just that….but just one problem, no life long e-mail address (who does anyway! ), well, much to handphone numbers I guess. So many of us just changes phone numbers once in a while that it’s hard to keep track at times and is one of the cause of “catching up with friends is hard”. 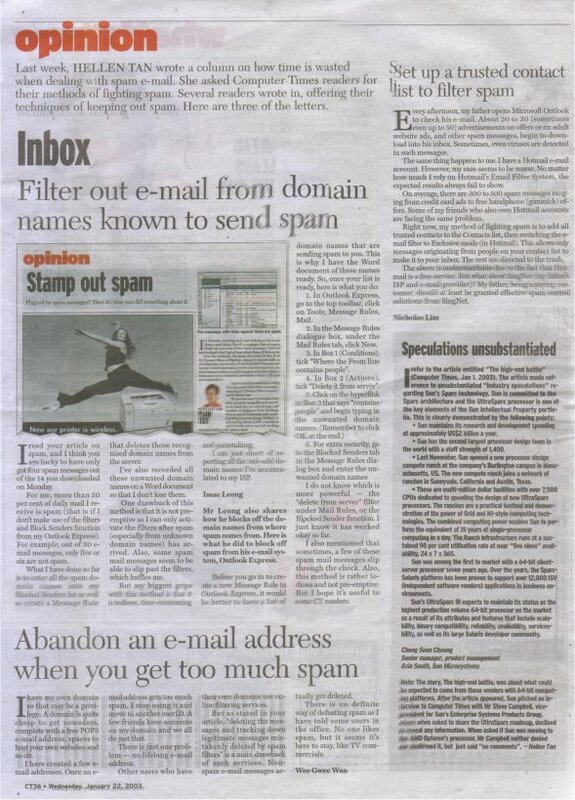 Others with their own domain tries out online filtering services but as stated in your article “deleting the messages and tracking down legitimate messages mistakenly deleted by spam filters.” Wanted mails actually gets deleted so that’s the main problem for these filtering software. Recently, there was a report (sorry forgot the source) that one research fellow is hoping to create an e-mail that expires that one can use to do online purchase, or things like that, a one time kinda use. Hope it’ll be something useful. There is no definite way of defeating spam as I have told some users in office. No one like spam but it seems they’re here to stay as with TV commercials. Stamp out spamPlagued by spam messages? Then it’s time you did something about it. It’s Monday morning and I am looking at my Lotus Notes e-mail inbox. Out of 14 messages, four are spam. That’s 28.5 per cent of the e-mail messages I received last weekend. And I get at least about three of these a day. Over the weekend, the spam that came in was from Dr Thomas Okon, a Nigerian, asking to deposit millions of dollars into my account, Worldlink SMS Gateway selling me a short messaging service marketing tool, one from Saisons Gallery on gift hampers and from Echartbook.com on an electronic newsletter which I did not even subscribe to. I spent about five seconds scrolling through each of the three messages, skipping Dr Thomas Okon because I knew what it was. The process took 15 seconds of my time. It may be insignificant in my 10- to 12- hour day, but what if each staff member at Singapore Press Holdings were to spend 15 seconds each morning doing the same thing? Multiply 15 seconds by about 3,000 employees and it works out to one full working day spent dealing with spam e-mail. The messages with ticks against them are spam. Spam e-mail has reached such proportions that companies and individuals can no longer just ignore them, delete them or just accept them as part of their e-lifestyle. Jupiter Research, a United States-based research firm, forecasts that the average American will get more than 2,200 spam, or unsolicited bulk e-mail, messages this year and 3,600 by 2007. Recently, Ferris Research said US businesses spend US$8.9 billion (S$15.4 billion) a year in lost productivity and anti-spam measures. In Europe, this cost was estimated at US$2.5 billion. The “costs” pertain to time and lost opportunities. 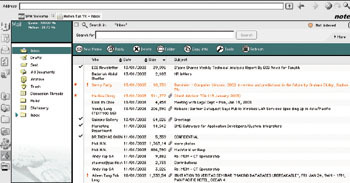 It includes time spent deleting the messages and tracking down legitimate messages mistakenly deleted by spam filters. It was reported that America Online (AOL) was recently awarded nearly US$7 million in damages against a “spam ring” that bombarded its members with junk e-mail messages pitching adult websites. This case is seen as an important legal victory against spamming. One of the defendants was CN Productions, a company AOL successfully sued in 1999. Then, AOL had won damages against it as well as an injunction barring the company and its president from sending junk e-mail to AOL members. AOL has filed about 20 such lawsuits over the years. AOL said CN and associates transmitted more than a billion junk e-mail messages, accounting for a quarter of complaints AOL received about spam that promoted adult sites. I don’t think spam can be totally wiped out of e-mail inboxes. In Singapore, the Infocomm Development Authority had said that the act of sending bulk e-mail, faxes and SMS messages is not illegal. But the AOL case is clear: If you are against spamming, don’t just fume silently — let your Internet service provider (ISP) know. Some of you might have already tried asking your ISP to do something, but nothing came out of it. I will try and try again, until someone listens. Companies should ask their employees how many spam e-mail messages they get every day. A simple calculation will highlight the huge amount of time wasted on spam — time that could have been productively spent seeing a customer or making a sales call.